Read the entire media release here. Additionally, Amazon has expanded its Career Choice program to include funding for associates to earn North American Board of Certified Energy Practitioners (NABCEP) certification. 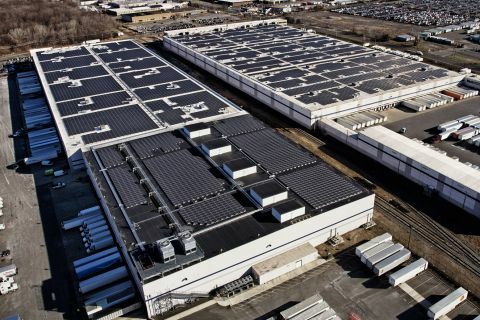 Photo by P2 Photography: Aerial view of two Amazon fulfillment facilities with solar systems on their rooftops. This entry was posted in NewsBlog and tagged Amazon's sustainability initiatives, corporate buyers of renewable energy, Nebraskans for Solar on March 2, 2017 by Helen Deffenbacher.